Malia Obama is officially a college student. The oldest daughter of Barack and Michelle Obama moved into her Harvard University dormitory on Monday afternoon, one day before her fellow students began arriving with their parents. The family was joined by members of the Secret Service as they pulled up to Malia's new residence in a two-SUV envoy, managing to avoid detection despite the thousands of people around the campus and in Cambridge. That was due in large part to their timing, with the Obamas electing to get everything moved and Malia settled into her new digs during the solar eclipse. 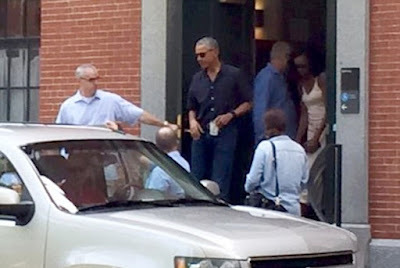 Barack and Michelle had their sunglasses on long before they exited Malia's dorm and kept their faces looking down as they rushed into their SUV, leaving their daughter behind to start her new life at dad's alma mater.